Правильный ремонт двигателя - в каждый регион! Компания «СП В.М.С.», представленная сетью Центров «ПроМотор», является лидером в области механической обработки деталей ДВС в Украине. 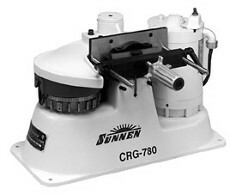 The Sunnen CRG-780 Cap and Rod Grinder handles main bearing caps and connecting rods. It cuts connecting rod parting faces square and straight - just like new. The CRG-780 first grinds a reference surface, square to the parting face of the main bearing cap. The parting face is then ground from this square, accurate reference surface. The original relationship between parting face and bore wall is maintained. Grinding the parting surface of the main bearing caps leaves all the main bearing bores "undersize" when caps are bolted back in place. The main bearing bores are then line honed. This process results in factory accuracy assuring proper crankshaft support and lubrication. Hardened steel face plate and locating pin assures top accuracy. Grinding wheel feeds in .001" increments for precision sizing.